If you’ve been avoiding us, we won’t take it personally. In fact, a large percentage of Americans avoid seeing the dentist. There are many reasons people skip out on visits to my dental office in Douglasville. We’d like to cover some of the main reasons and let you know that we’re not only here to get you healthy, we’re here to comfort and relieve any inhibitions you may have too. At the top of our list are fear and anxiety. Just as there are individuals who are afraid of heights or spiders, there are also those who have a cold-blooded fear of the dentist. In actuality, fear of the dentist, also known as dentophobia, is pretty common. Whether it’s mild or severe, a fear of the dentist can result not only in anxiety, but also in refusal to visit a dentist in Douglasville. This is especially concerning since those with an extreme fear who don’t get regular cleanings and checkups are at increased risk for scary dental problems like heart disease, strokes, and much more. 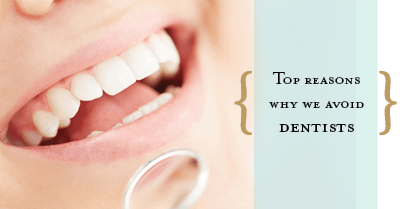 There are many people whose fear of the dentist has stemmed from a prior bad experience. If you’ve had a dental treatment that hurt once, you’ll probably think it will always hurt. However, most of these bad experiences occurred when a patient was younger and dental technologies weren’t what they are today. It’s important to tell us if you fall into this category we’ll work with you to relieve your fear and reassure you that our comforting techniques will not only get you healthy, but do so in a pain-free way. People who have neglected their dental care for a while are often concerned that once they get back into the dental chair, they’ll get lectured on their brushing and flossing habits. Lecturing you on your dental hygiene routine isn’t a productive way to get you excited about your dental health and to keep you coming back for regular checkups. Instead of lectures, the team at my Douglasville dental office will talk with you about your mouth and teeth, educate you on the importance of regular checkups, and help get you back into a healthy routine. No lectures needed, just encouragement, understanding, and compassion. If you’ve been avoiding the dentist because of any of the reasons above, or even for a different reason, give my dental office in Douglasville a call. We’ll work with you and talk to you about your fears and make sure that your treatment is comfortable, easy, and relaxing. We talk a lot during your visits to my Douglasville dental office – about your kids, your job, your spouse, and your teeth – but sometimes we have even more to say and not enough time to say it! So I’ve decided to put the most important things we want our patients to know right here. While your eyes may be the window to your soul, your mouth is the window to your whole body. There is a very strong connection between your oral health and your systemic health, or whole body health. In fact, disease in your mouth puts you at greater risk for heart disease, stroke, and disease of your brain, liver, pancreas and so much more. On the other hand, a healthy mouth is linked to a longer, healthier life. This is why keeping up with your appointments at my dental office in Douglasville is so important. We’ve only covered three really important facts in this blog, but that doesn’t mean there still isn’t more to know. If you have any questions, or need to schedule your regular checkup or more in depth treatment, give my Douglasville dental office today. Serving patients in Douglasville, Lithia Springs, Villa Ricca, and surrounding areas.